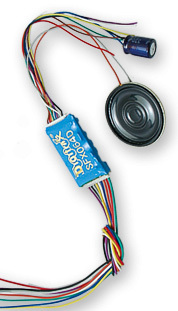 Dear HO Modelers: Digitrak has announced 4 new decoder products with sound. The first three are intended to be used with the New Decoder & Sound ready Kato Engines AC4400, SD38-2 and F40PH. SDH104K1A+FN04K1 Combo Plug'N Play for Kato AC4400 Locomotives. Preloaded with AC4400 sound scheme. SDH104K1B+FN04K1 Combo Plug'N Play for Kato SD38-2 Locomotives. Preloaded with SD38-2 sound scheme. SDH104K1C+FN04K1 Combo Plug'N Play for Kato F40PH Locomotives. Preloaded with F40PH sound scheme. SFX064D SoundFX+Function Combo Wired SoundFX decoder for most HO Locomotives. Preloaded with selectable steam and diesel sound schemes. Wired Mobile Decoder with SoundFX?+Accessory type functions for most HO Locomotives.